Students love engaging in the multitude of activities on this disc. Supports curriculum in life science and geography. Context-sensitive definitions on virtually every word and spoken pronunciations on significant words support ESL learners. Provides a visual overview of all topics and ensures users never get lost. Allows users to quickly find any topic. Supports blind and visually-impaired students as well as slow readers and auditory learners. The Digital Field Trip to The Wetlands automatically checks for updates. Allows for full screen or window display. What is The Digital Field Trip to the Wetlands? This Digital Field Trip uses virtual reality technology to allow students to visit a bog in Ontario without getting their feet wet! It is a truly interactive program incorporating animations, narration, games, text, full color photographs and a comprehensive workbook in one easy-to-use package. The Digital Field Trip to The Wetlands makes learning biology an enjoyable experience; students have fun and are able to learn independently through exploration and discovery. The Digital Field Trip to The Wetlands teaches the principles of wetlands ecology and encourages an awareness of the importance of wetlands conservation. 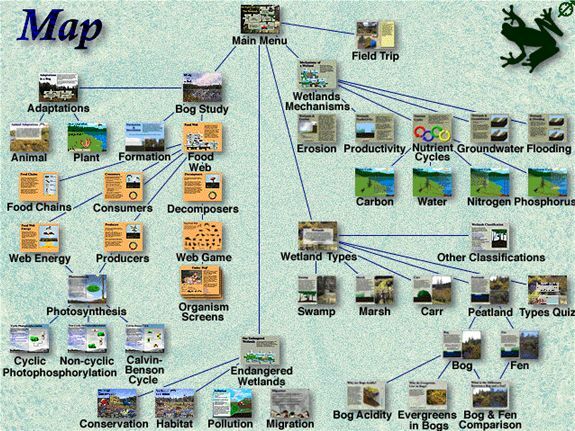 The five modules, Field Trip, Study of a Bog, Wetlands Types, Mechanisms of a Wetland and Our Endangered Wetlands are integrated into one fully interactive learning tool. 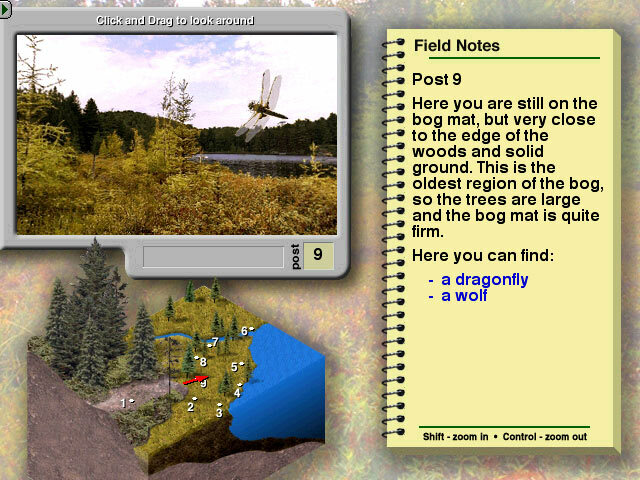 The Field Trip module uses virtual reality technology to allow the student to explore the Cloud Lake bog in Algonquin Park, Ontario, Canada. 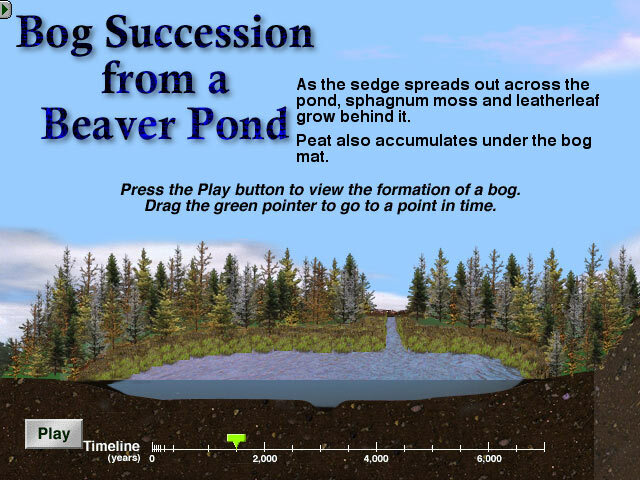 The Study of A Bog module includes The Bog Food Web, Plant and Animal Adaptations, Formation and Succession, as well as an in-depth study of Photosynthesis. The Wetlands Types module covers the similarities and differences of the various wetland types. The Mechanisms of a Wetland module addresses topics such as nutrient cycles, erosion, groundwater, productivity and flooding. Our Endangered Wetlands deals with the issues of conservation, habitat and pollution. The Digital Field Trip to The Wetlands is a stand-alone disc that requires no training beyond that needed for normal Macintosh and Windows use. A simple point and click interface, context-specific help and a map of the whole project, ensure that students never get lost. Who would benefit from using it? The Digital Field Trip to The Wetlands is geared toward high school students but encompasses topics accessible to students of all ages, natural history enthusiasts, biologists, libraries, and anyone interested in ecology and the environment. Students whose first language is not English will love this program as they can click on most words to see a definition and hear the pronunciation. The Digital Field Trip to The Wetlands will run directly from the disc, or the program can be installed on a hard drive. 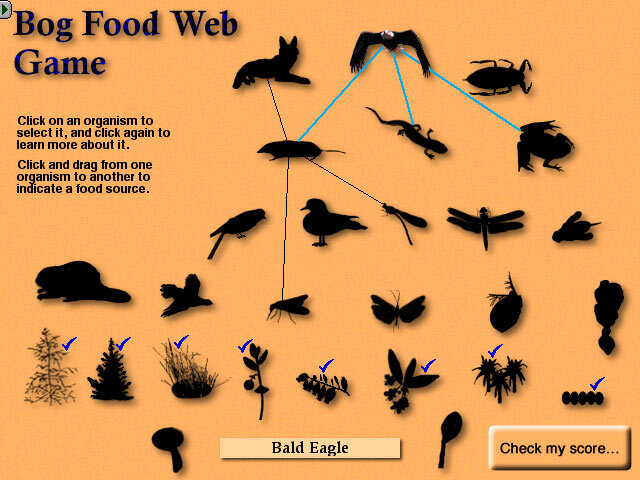 The modular Teacher/Student workbook materials, included with the program provide a structured way to explore The Digital Field Trip to The Wetlands, as well as a useful field guide that can also be used for a real field trip. The Digital Field Trip to The Wetlands runs on both Macintosh and Windows platforms. Educational versions start at $84 ($60 for home versions). Multiseat pricing is available, to find out more check out our full price list.